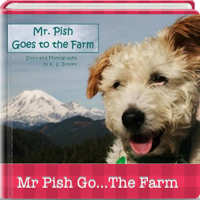 This app complements the bestselling book, Mr. Pish Goes to the Farm. The adventurous traveling terrier, Mr. Pish, takes us on a personally guided tour to show us what goes on at a farm. With fun narration, interactive questions, music, and animation, the Mr. Pish Goes to the Farm app will get kids excited to learn more about farming.